Soon after the Big East announced that the new name for the contingent that won't retain the Big East name would be the American Athletic Conference, they announced that the logo would be coming soon. I've been looking forward to it, as I enjoy seeing a new conference, especially my own, take shape. 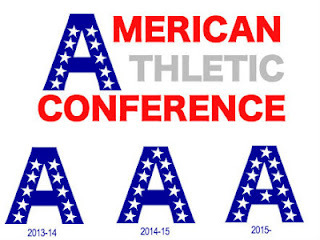 Look, as I've already stated, I've got no problem with The American as our conference name. I also recognize that once you go that route, the use of red, white, and blue is pretty self evident. This isn't what bothers me. Rather, I'm not a fan of the fact that the designer chose to make glorified WordArt with all of the My First Day with Photoshop tricks. "Outline? You betcha. Drop shadow? You're damn right. Gradient? Yes please!" That, with the unnecessarily asymmetrical star (I'd love to hear the rationale here. Is the long arm pointing towards the conferences northeastern beginnings?) makes for what I believe is a weak looking logo. You've got stars. You've got stripes. You've got the likeness of Old Glory. And what's more, you've got room for growth. The logo's primary peel off, the Starred A, currently contains 10 stars, representing each of the ten members that will begin play with the league in 2013. In 2014, when the league adds one more (or more accurately, loses two and gains three), an eleventh star can be added at the apex of the A, much as our national flag adds stars when new members join. Finally, in 2015, when The American adds Navy and reached its full (as we know it) capacity, a twelfth star can be added to the crossbar. That's it. It's simple - most of the conference logos are. Someone with some font expertise could make it distinctive. The Starred A could look sharp on fields and uniforms, especially if adjacent to or opposite the American Flag itself. I would have loved to see the conference go this route.